On dark winter evenings in December, the brooding gray beauty of Seattle is suddenly transformed by a “parade of lights” – the magical appearance of the Christmas Ship, with a wonderful choir on board, accompanied by a flotilla of perhaps fifty vessels decorated with myriad colored lights reflecting off the jet black waters of Puget Sound, Lake Union, the Ship Canal, and Lake Washington – joining the lights of the city in a joyous dance of celebration. The Christmas Ship “Spirit of Seattle” is provided by Washington’s premier cruise fleet, “Argosy.” As the ship moves majestically through the water, various vessels of the flotilla seem to scamper about “the mother ship” – almost as if they were children excited by the holiday merry-making. The Christmas Ship reaches its destination – a park – and its coming has drawn thousands of Seattlites to the shore, where they have built a huge bonfire and listen to a beautifully amplified concert of HOliday music that echoes from the surrounding hills. The Seattle Girls’ Choir is on board this night, and sings a holiday gift of music to an appreciative community. 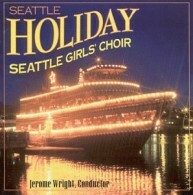 Their annual appearance on the Christmas Ship is regarded by the Seattle Girls’ Choir as a highlight of each season. This unique celebration was a unanimous choice for the cover of our first recording.